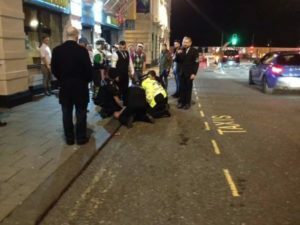 Three councillors were given a close up look at the way police try to tackle drug dealing in the centre of Brighton last night (Friday 3 June). The three Conservatives – Lee Wares, Dee Simson and Andrew Wealls – joined a Sussex Police task force codenamed Operation Ice. The operation, headed by the force’s licensing unit, targeted illegal drug dealing and misuse around West Street, Middle Street and Duke’s Lane. Police set up drug analysis equipment in a bar and night club where everybody was invited to allow a swab of their hands to be taken. Detection of low traces would result in people being denied entry and higher traces potentially leading to body searches and possible arrest. A “drug” dog unit working with the team was able to move freely among people in the streets and queuing for the clubs supported by plain clothes and uniformed officers. Leaflets were distributed by the police to advise people of what was happening. Councillor Wares, the Tories’ lead member on Brighton and Hove City Council’s Licensing Committee, said: “This was a high impact and visible operation. Police officers took a zero tolerance, no nonsense approach to the issue. “The bottom line was, if you had been suspected of being in contact with illegal drugs or had used them, there were consequences. “The presence of the dog unit and the co-operation of the premises’ management I hope will send a clear message that everybody is working together to try and curtail the misuse of illegal drugs. “Clubs operating the ID scanner system would be able to record why somebody was denied access and share it across the other clubs making it a very early evening to go home for some, if not a trip to the custody suite. “Most of us have seen or heard of the consequence of drugs such as cocaine and alcohol being mixed. “I was still surprised to witness how aggressive and violent an individual was when arrested by the police for assaulting somebody. It took four officers just to hold the person on the ground and eight to get them into the prison van.